This product is no longer available and has been replaced by: CFMC2G. The CFMC1G is a 1 GB, industrial-grade CompactFlash card that has been selected specifically to provide optimum performance and extreme reliability. It is used with the CFM100, NL115, or CF1 to expand a data logger's memory and to transport data, camera images, programs, and operating systems without having to use a PC. A PC can read/write data stored on the CFMC1G by using either the CF1 CompactFlash adapter or 17752 Reader/Writer. CR9000 (retired) The CR9000 requires a CR9080 PAM module. 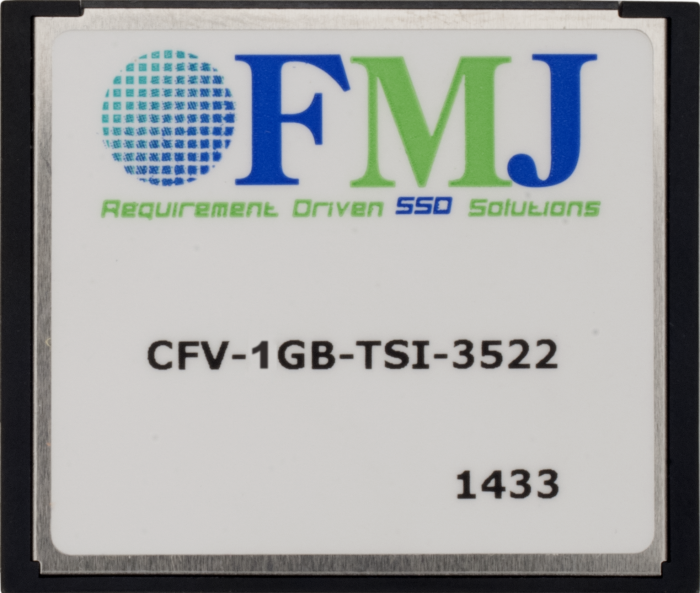 CFMC1G cards purchased after August 2008 are formatted as FAT32; our contemporary data loggers require this format for the card to work as expected. Cards purchased before August 2008 were formatted as FAT16. Our CC640 camera (retired), the CR9000 dataloggers (retired), and CR5000 dataloggers with older operating systems need the FAT16 format. A card formatted as FAT32 can be reformatted as FAT16. What is the largest memory card that can be used with a CR5000? With OS 7 or greater and the TableFile() instruction with Option 64, CompactFlash cards greater than 2 GB can be used. For more information, see the “A Better Way to Write High-Frequency Data to 16 GB and Smaller CF Cards” application note. What is the fastest way to download more than 5 million records from a CR5000 to a PC? Save the data to a CompactFlash card. Transfer the data from the CR5000 to the PC by removing the card from the CR5000 and inserting it into the PC. Using a CompactFlash module, a data logger, and the BMP5 Direct SDK, how can data be downloaded from the memory card instead of the CPU buffer? Using the FileControl() instruction, the .dat files can be retrieved directly from the memory card. When data is collected by the standard method (not as downloaded files, but as streamed data) with a GetData() or similar instruction, the memory card is automatically used as a source of records to be returned when the internal CPU table no longer contains the oldest data. These records can be retrieved simply by using their record numbers. What is the largest CompactFlash memory card that can be used with the CR3000 or CR1000? With operating system 25 or greater, the CR3000 works with CF cards in sizes up to 16 GB using the TableFile() instruction and TFOption 64. For earlier versions of the operating system, the largest compatible CF card size is 2 GB. For more information, see the “A Better Way to Write High-Frequency Data to 16 GB and Smaller CF Cards” application note. How should a CompactFlash card be formatted? The most reliable method of formatting a CompactFlash (CF) card is to format it using a PC and specifying FAT32.